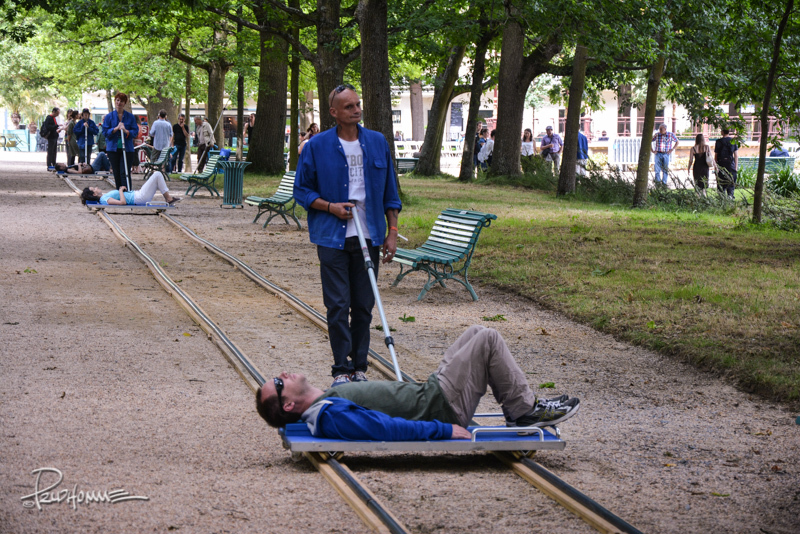 This past summer I visited the city of Rennes as I often do on my way to Dinard, France. We usually just go right through the city after a long voyage from New York. 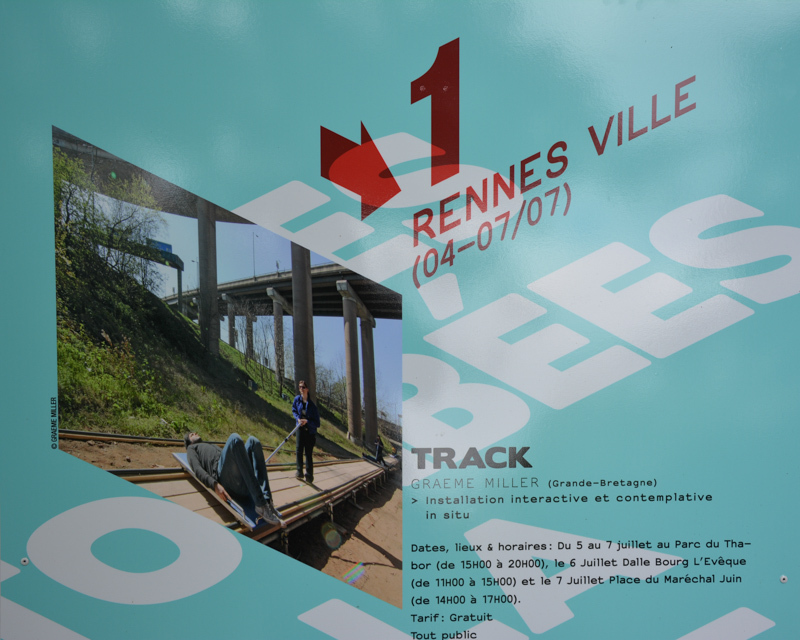 We take the TGV from Paris and then head to Rennes. After that, we then hop on a car for an hour-long drive to our final destination. Every so often we do go back to Rennes for a day trip to visit our awesome nephew. This year I decided to venture into the city solo to meet him. 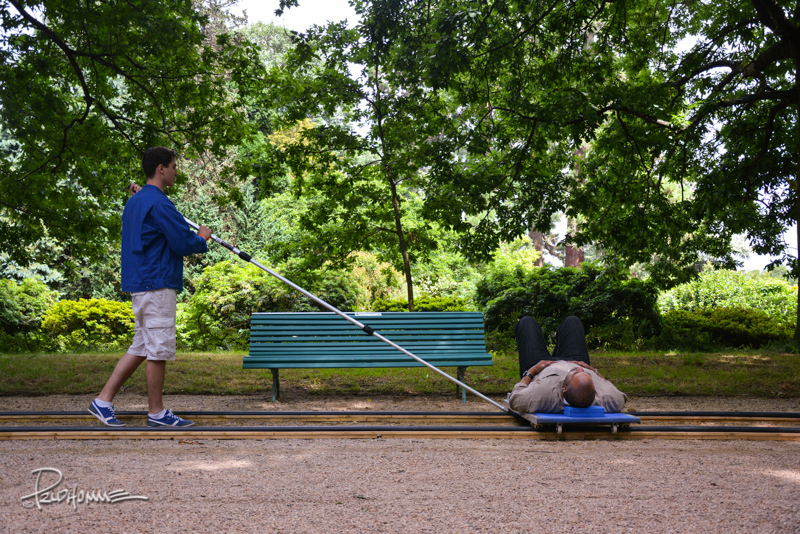 I walked the streets and took some pictures and watched the people of Rennes go about their daily tasks. It was a great walk because I practically didn’t know where the heck I was going. Eventually I communicated with my nephew via text and met at a beautiful local cathedral. After having some crepes and wine for lunch, we met up with his friend. They both gave me a great tour of Rennes, specifically it’s beautiful park in the heart of the city, Le Parc du Thabor (The Thabor Gardens). In another post I’ll put up some pictures but for this post, I wanted to share my unusual relaxing “activity” I participated in. It was simply called the track. 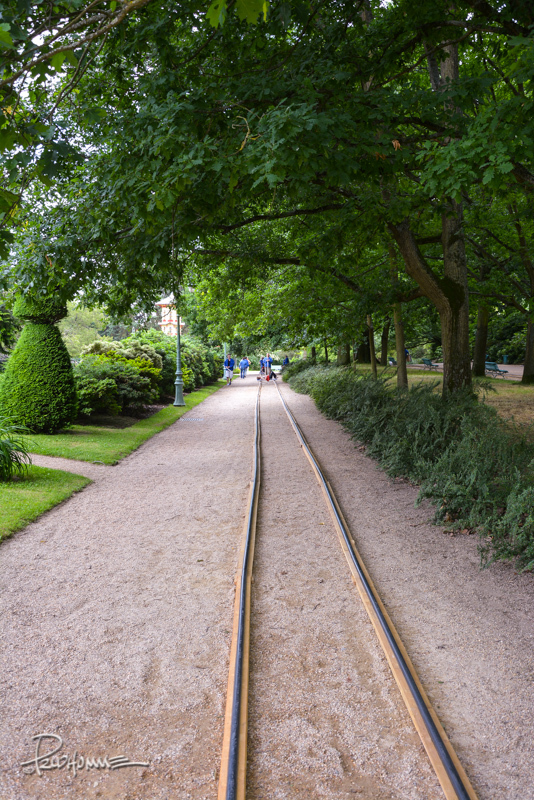 As we walked through the park, we noticed two sets of long tracks. 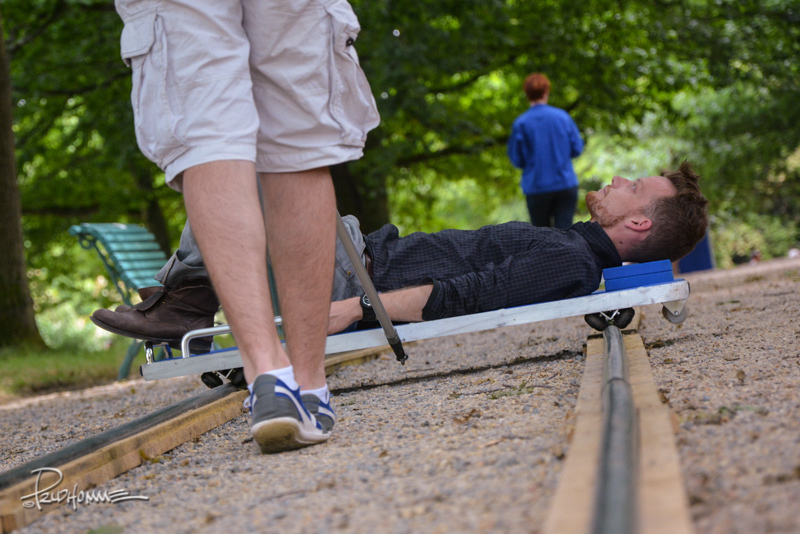 On the track was a platform perpendicular to it with people laying on it facing the park’s trees. They were pushed by men and women wearing blue shirts. Immediately intrigued, I wanted to know more about it. I’m sure that my nephew and his friend were more than willing to simply walk past it but I had to know more. At the very beginning of the track, I see a camera crew interviewing a man. They were speaking in French of course so I had no clue what this was all about. My nephew listened in and later explained to me that they were interviewing the brainchild of this free exhibit. He had me at the word free (gratuit in French!). Surprisingly there was no one on line for this. Perhaps people were feeling a little squeamish about it. I volunteered to get on and the waiting young man was more than eager to oblige. I made a joke about getting a stronger guy to push me as he was going to be building a sweat with this customer (the joke was lost on the non-English speaking young man). I had to try this out for myself! I got on and let him push me along. 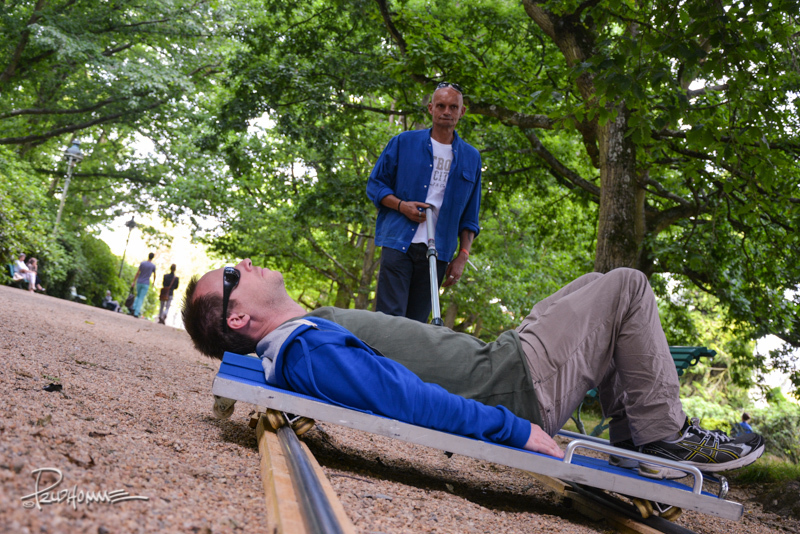 I was a little distracted because I was self-conscious of the fact that I was in a unfamiliar park in the middle of France being pushed along the ground by some stranger. I could feel the stares and hear the French language as curious onlookers wondered what was going on. I had to shut it all out because the whole point of this experience was to make participants feel relaxed and in tune with nature in this bustling metropolitan city. This was the view while on the track. It was quite peaceful. I stared up and tried to focus on something else. 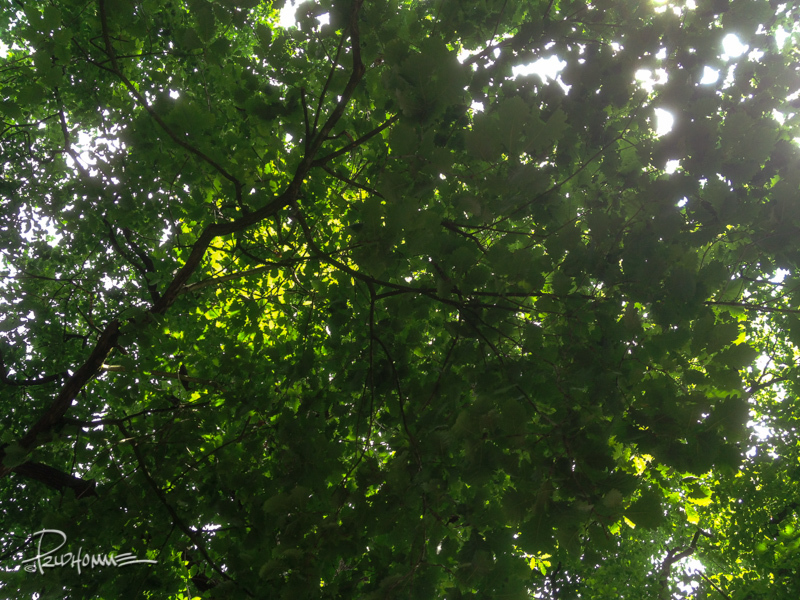 I caught snippets of the bright blue sky and the white clouds through the heavy verdant canopy above. I imagined floating down some river and letting myself go. The movement was slow, steady and smooth. It was easy to get lost in your thoughts after you get used to it. Unfortunately, all good things must come to an end. After seeing that I had a fun go at it, my nephew gave it a try. He really liked it as well. For the rest of the day we explored the park and even sat at the outdoor eatery and had a few drinks. Looking back, getting on the Track was something unique, spontaneous and fun while exploring the beautiful city of Rennes. I would love to do this again. I can picture this track in Central Park, NY. If you’re ever stateside Mr. Miller, set it up and let me know! 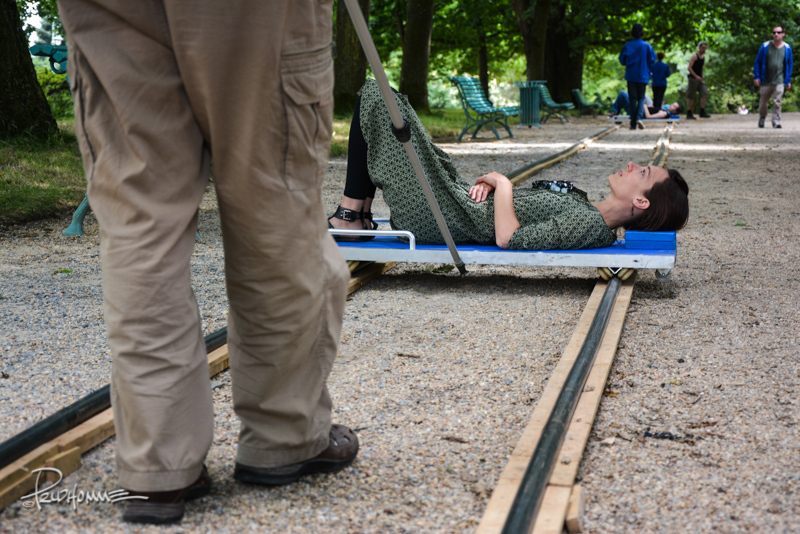 There was another track set up at another location outside of Rennes.